Tunisian Prime Minister Habib Essid speaks with The Associated Press during an interview ahead of a two-day conference in Madrid on combating the type of terrorism targeting foreign tourists that has hit his country twice over the last year, Spain, Tuesday, Oct. 27, 2015. Tunisian Prime Minister Habib Essid said Tuesday his country needs jobs to counter the threat of terror attacks like the two this year that targeted tourists, but his nation's important tourism sector won't fully recover for another two to three years. Essid told The Associated Press in an interview that the unemployment rate in Tunisia of 15 percent nationally and 33 percent for young university graduates is the biggest risk factor for future attacks. "There is an economic problem and jobless people who don't have any other solution economically, so they go and become terrorists," Essid said before attending an international conference on extremism by the Madrid Club group of former global leaders and heads of state. "The root of the problem is the high degree of joblessness." Tunisia's tourism industry was hit hard this year following an attack in March on the National Bardo Museum in the capital, Tunis, that killed 22 people, and a June attack at a beach resort in Sousse that killed 38. 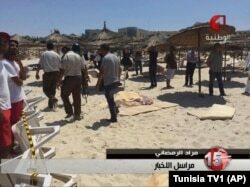 In this screen grab taken from video provided by Tunisia TV1, injured people are treated on a Tunisian beach at the resort town of Sousse, June 26, 2015. Most victims were tourists, prompting a huge drop in demand from European visitors for a country that experts say depends on tourism for about 20 percent of its economic output. Tourism is slowly starting to recover but Essid predicted it will be "a matter of two or three years until the sector gets a full recovery." He said the government has acted to protect the country from the advance of Islamic State militants in Libya, who recently extended their reach to the Mediterranean city of Sabrata, just 70 kilometers (43 miles) from the Tunisian border. "We have information that the risk is there and we have taken into account these new elements with the deployment of our armed forces," Essid said. He said Tunisia's efforts to protect itself from the IS advance include a 200-kilometer (124-mile) earthen berm constructed along the border, plus beefed-up border controls and military presence. The Nobel Peace Prize won this month by four Tunisian civil society groups who steered the North African nation away from civil war and toward democracy after its 2011 revolution is proof the country can emerge stronger from crisis, Essid said. "It shows we can succeed in a situation when from the outside they say it is impossible," he said. The nation's National Dialogue Quartet — the main labor union, the bar association, the employers' association and the human rights league — was recognized for its negotiations which carried Tunisia through a constitutional crisis and laid the groundwork for the only democracy that remains following the 2011 Arab Spring demonstrations. In a gesture of solidarity Tuesday with Tunisia, top French cultural figures held a special ceremony at the Bardo, Tunisia's premier museum, to announce finalists for France's most prestigious literary award, the Goncourt Prize.